Focus on recyclable shopping bag more than 10 years, BagDream is the professional manufacture which devotes to providing the competitive price, excellent products and service. •Our kraft shopping bags are glossy paper which make them a little more elegant looking than the plastic which tend to tear easily. •The retail paper bags are perfect size and work beautifully for your business. At this price, they are nice to be able to place product in such an elegant handy bag for your customers. On the other hand, you could print your own labels/logo stamp and put them on each bag, made the shopping bags on behalf of your store. •Besides, they are perfect for decorating. You could dress the orange bags up by using ribbon, markers, glitter and pompoms. It it a great way to let the children bring out their creative side that letting them sit color and draw on these bags. Different color will perfect for Easter, Christmas, Thanksgiving, baby shower, any patriotic holiday or birthday and etc. It is a really fun experience and created a lot of cute memories! ☑Bags Material: 110g basis weight. Made of 100% PCW Recycle Paper with a serrated top edge. ☑Brown color of paper shopping bags: It is versatile for just about anything, including gift wrapping, hand lettering and rubber stamping. 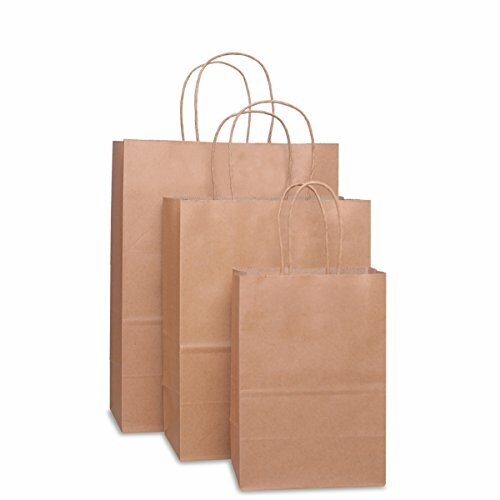 PERFECT SIZE PAPER BAGS - 5.25x3.75x8& 8x4.75x10.5& 10x5x13 Inch, 25pcs each size. 110g basis weight kraft paper with a serrated top edge. These brown bags are made of 100% PCW Recycle Paper. FSC COMPLIANT. BagDream kraft paper bags are BIO-DEGRADABLE and RECYCLABLE. No peculiar smell and look a lot classier than giving customers those white plastic t-shirt style bags. The paper gift bags are UNDECORATED, you could let the kids decorate these bags with drawing, coloring and etc for different holidays, or you could staple your business card or stamp the outside of the bag with your logo on them. MULTIPLE USES - Different size paper bags are suitable for your needs. Great for goodie bags, favor bags, shopping bags, gift bags, kraft bags, retail bags, mechandise bags and standard paper bags. If you have any questions about this product by BagDream, contact us by completing and submitting the form below. If you are looking for a specif part number, please include it with your message.